Home » News » Furnace Air Filter Guide: What Air Filters Are Best? The furnace air filter is a critical component of any forced air HVAC system. There are different types and sizes offering different benefits for cleaner air and HVAC equipment. With regular furnace filter maintenance, your HVAC system will perform optimally – here’s what you need to know to make smart furnace filter choices for your home and system. Fiberglass or synthetic filters are a cheap and disposable option for your furnace. They catch up to 80% of particles 50 microns and larger and 25% of particles between 3 to 10 microns. Considered minimum protection, fiberglass/synthetic filters prevent dust and dirt from building up on heat exchangers, fan motors, and other surfaces. The larger particles are trapped and eliminated, so your furnace components remain clean. They allow your system to have maximum airflow but don’t filter harmful contaminants affecting your health. Polyester filters are made using the highest quality materials available and are median-sized. They trap and eliminate 80% to 95% of particles 5 microns or larger. A polyester filter costs fours time more than the average fiberglass/synthetic filter, but it offers more protection against pollutants that cause health issues. Electrostatic filters use self-charging fibers to attract particles out of your air. You can purchase disposable or washable electrostatic filters depending on the requirements of your furnace. Washable versions offer a MERV rating between 4 and 10 and last considerably longer than the average filter. Maintenance on a washable filter requires soap and water to wash the filter and letting it completely dry before reinstalling it. If you install it before it completely dries, you run the risk of mildew and mold growth. A pleated filter offers high-efficiency results by trapping particulates 0.3 micron in size, such as bacteria and viruses. 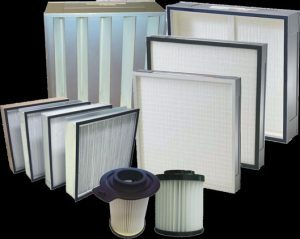 Pleated filters are more efficient and last longer compared to fiberglass/synthetic filters. They eliminate more pollutants from your air without sacrificing airflow within your system. High efficiency particulate air, or HEPA, filters provide high-end filtration by trapping up to 99% of particles 0.3 microns or larger. Even though they are excellent at eliminating indoor pollutants and create a healthier environment in your home, they can drastically reduce your system’s airflow, costing more money in energy usage. In addition to styles, furnace air filters have different ratings. Filters are rated by MERV (minimum efficiency reporting valve). The higher the number, the more efficient it is at removing contaminants from your air. These filters offer a minimum amount of protection as they are primarily designed to assist the cleanliness of the HVAC units by filtering out particles that can damage the coils and harm the efficiency of the unit. They remove pollen, dust mites, and other harmful fibers. With 20% dust spot efficiency, these filters are the best option where budget is a concern and health issues are minimal. These filters are a step up from the MERV 1-4 air filters. Here, the air filter is able to also remove mold spores and dust from the air. These filters have a 20-35% dust spot efficiency and offer higher air filtration than lower rated filters while remaining budget friendly. These filters catch the smaller particles such as those known to cause allergies. A MERV 9-12 filter will remove pet dander, auto emissions and other smaller airborne particles from the air, creating a cleaner air supply. This is a great choice for those who have mild to moderate allergies or other respiratory ailments. The MERV 9-12 filters will also extend the life of the HVAC system by keeping the unit clean and free of debris and dust build-up. These filters are the highest quality home filters available other than HEPA filters, making them great for those who are often afflicted by allergies and respiratory issues. The filters in this range are the ultimate protection against dust, pollen, mold, bacteria, viruses and the smaller airborne particles that often make breathing difficult for people with advanced sensitivities to poor air quality or weakened immune systems. As the ratings of the air filters increase, so do the prices, but the extra cost is worth it to keep your home healthy and comfortable. Furnace air filters come in different sizes. It is important that you select a replacement furnace air filter that fits your unit’s filter cabinet correctly, or else you will have airflow obstructions, hindering the performance of your HVAC system. How Often Should Furnace Air Filters Be Changed? Furnace air filters need to be changed on a regular basis because they become clogged with pollutants over time. Failing to change your filter will result in airflow obstructions, stressing your system and leaving your home without the desired heating and cooling. Most filters have a recommended guideline detailing how long they last or when they should be changed. When you purchase a new filter, check the packaging for these details. The standard time recommended to change a high-quality air filter is at least once every three months. However, if the filter appears dirty, change it immediately! Dirty or clogged air filters prevent healthy air flow, damage components inside your air conditioner, and decrease your system’s efficiency. When you have more contaminants in the home, from pets, people, and activities, air filters should be changed more frequently.